The MkII design features a redesigned boarding ladder which can be deployed from the water. 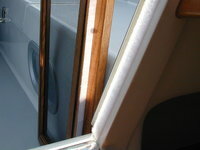 On my pre-MkII boat, ladder deployment, if in the water and not having a mate onboard, was a concern of mine. I attached lines to the latches and to the ladder and they can easily be reached while in the water. The lines release the ladder and pull it down to the water. Safety is a good thing.